Above Images courtesy of FeLion Studios. As part of Laumeier’s After Dark: Fire & Light event, Laumeier will host a public iron pour, in partnership with Six Mile SculptureWorks. 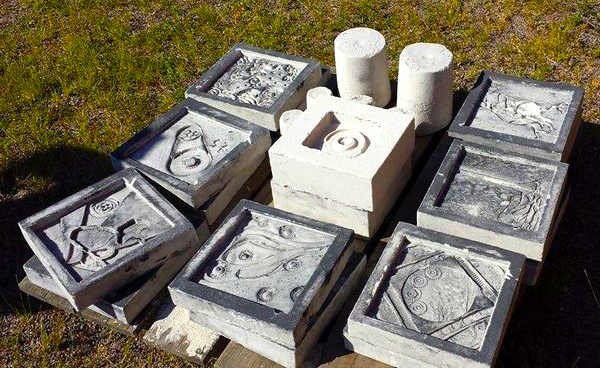 In anticipation of the event, Laumeier is offering three community scratch block workshops that will allow participants to design their own mold to be cast during the event. Create a unique cast iron sculptural tile of your own design! Use simple drawing and carving tools to make a cavity for the molten metal to fill. Choose between a 6”x6” or 8”x8” block for your one of a kind work of art—which also make great trivets or garden stones. Anyone ages 4 and up can join in the fun! Your finished mold will be put on the pour line during Laumeier’s After Dark: Fire & Light event on Saturday February 9, where the “pour team”, made up of experienced artists, will pour 2,000 pounds of molten, 2,700 degree iron into scratch block molds! Workshops are FREE with the purchase of the scratch block. The number of scratch blocks is limited; Pre-purchase of the scratch block and workshop registration is required. You need only attend one workshop to complete your scratch block. Workshops will be held in an open format so that participants can arrive at their leisure and work at their own pace. Instructors will be available during workshop hours to inspire, answer questions and help you develop your piece. Allow for a minimum of 30 minutes to complete your piece; more intricate designs may take longer. • Saturday January 26, between 1 p.m. and 4 p.m. Registration for this workshop is now closed, walk-ins are welcome!